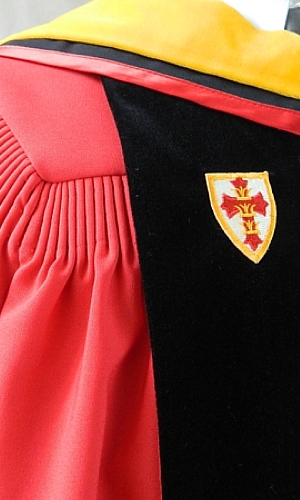 Ordering your authentic Boston University outfit is as simple as completing our easy-to-follow order form. 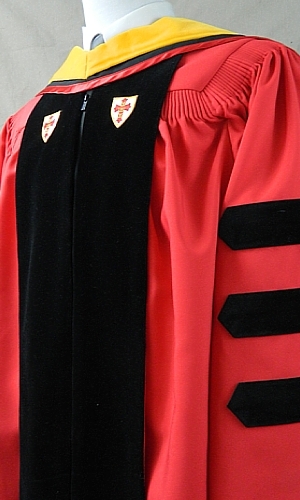 A special shade of red fabric is one of the most prominent features of the authentic Boston University doctoral outfit. Traditional style pleats, double-bell sleeves, a deluxe button and cord on the back with zipper front closure give this hand-crafted and custom-tailored outfit a distinctive appearance. 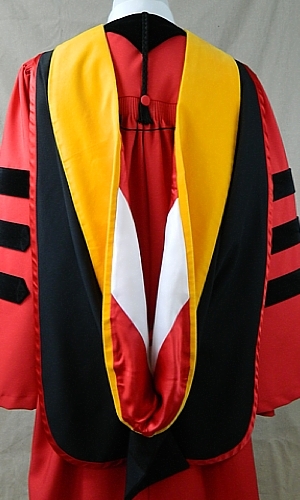 Rich black velvet doctoral panels and bars are clearly visible against the red fabric of the gown. 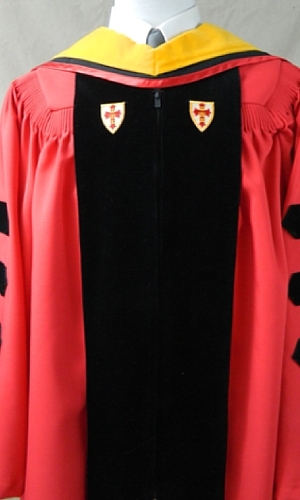 Embroidered Boston University emblems on the front velvet panels add the final touch to this already distinctive gown. 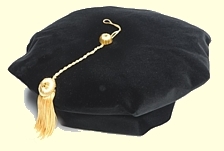 The proper cap to be worn with the authentic Boston University doctoral outfit is an 8 corner black velvet tam with a gold metallic tassel. 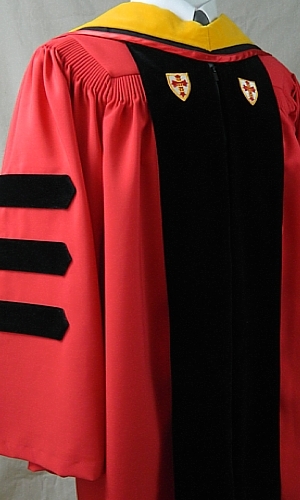 Your outfit would not be complete without the doctoral hood. 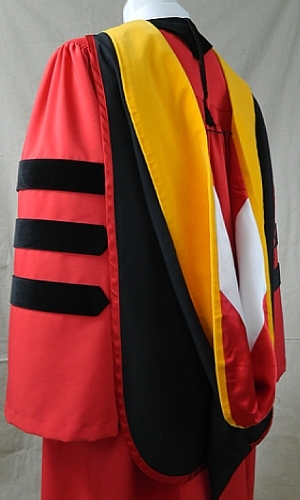 The Boston University doctoral hood is of the traditional style in design featuring a black shell with the lining in red with a white chevron. 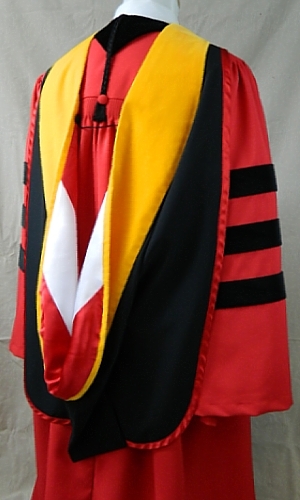 Velvet trim in the color representative of the degree conferred edges the hood. 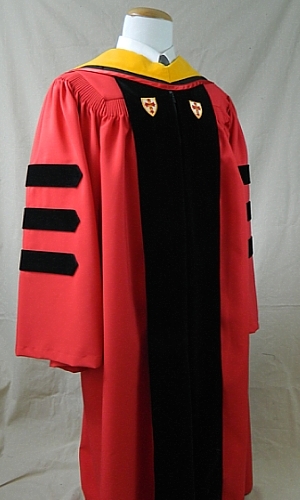 University Cap & Gown maintains an inventory of authentic Boston University doctoral gowns for immediate shipment. 8 corner black velvet tam with gold metallic tassel.